Then comes March, and I feel like Spring. I would wear light coat, hiding my padded jacket at the back of my wardrobe till next winter. I leave my wool scarves everywhere, in my car, at my parents’, at my friends’ houses. I choose now colourful and lighter ones, which flutter in the honey wind. Usually this premature and hopeful change of clothes causes me sore throat and a runny nose, but it’s Spring, it is worth risking a chill. When I was a child I would have to wait until Easter to wear my light jacket, being it an early one in March or a warmer Easter in April. Easter would have marked this transition to the good season. Now it’s my prerogative to decide when the warm season comes, and it usually coincides with my cravings for strawberries, ramps, asparagus. Yet March is a crazy month, you can spot the signs of the good season but you are still involved with the aftermath of winter, especially when the sun goes down. It is among the market stalls that you become aware of March oddity. Everyone is looking for Spring and you can see it from the colours: fava beans and fresh peas are on display on the stalls, still put on the side as they are now too pricey and not in the peak of season. Strawberries struggle to make their smell perceived, but they are still young, often imported, still lacking that irresistible charm they’ll show in a few months, when they’ll sweeten the market air. These fruit and vegetables are still out of season, but they make us long for Spring, so that we find ourselves looking in boredom at those products that accompanied us through winter. Cauliflower, Brussels sprouts, broccoli and kale. They’ve been our allies for the whole long winter, we enjoyed them roasted, boiled and drizzled with good extra virgin olive oil, steamed, in a salad, with rice or pasta or seasoned with garlic, anchovies and lemon, to make them brighter. During the first cold months I could never have had enough, just as with butternut squash. Now I feel like I ate my weight in cabbage, I want an asparagus frittata, or a bowl of borage ravioli. With fruit the situation it’s even worse. Citrus fruit are at the end of their season, apples and pears are still there, it’s true, but strawberries are still far from the peak of their fairy sweetness, not to mention stone fruit. If March makes me long for Spring, if I can wear lighter clothes with the only risk of getting a runny nose, in the kitchen I am still stuck in between my craving for green lightness and the persistent dominance of cabbage and root vegetables. So I choose artichokes. They lead us from winter to the safe harbour of Spring, you can deep fry them, stew them with tomato, make them stuffed with breadcrumbs or have them raw in a salad with lemon juice, olive oil and Parmigiano. According to the recipe we choose, artichokes can be the star of a winter dinner in front of the fireplace or the heroes of Spring lunches, bright salads and sunny days. To silence my craving for Spring I made an artichoke pie. The crust smells of olive oil and white wine, a recipe I learnt a few months ago from Laura and Taste from Abruzzo. It is a poor dough that has the advantage of leaving a good old fashioned smell on your hands, it is easy to be rolled out and once baked it becomes fragrant. It does not steal the show to the filling, but caresses it, leaving it free to shine. It is a typical crust you can find in many recipes of cucina povera: the olive oil was always there, in the pantry, as the wine, made at the end of the summer for the family. Wine and olive oil bind the wholemeal flour together in a versatile shell, which can hide any filling. Now, the filling. Artichokes, but also semi aged Tuscan pecorino, cut into thin slices, which melts softly in the oven, and a few tablespoons of goat taleggio, a delicacy found at the Sant’Ambrogio market in Florence. The taleggio makes the filling even richer, melting and delicious. Arrange all the ingredients on the table and start from the dough. Spoon the flours on a wooden surface, add a pinch of salt then slowly pour the olive oil and the wine, mixing with a fork to crumble the ingredients..
Now knead the crumbles until you get a smooth and elastic dough, then divide it into two portions, one slightly larger than the other. Roll out the larger portion of dough with a rolling pin and a sprinkling of flour. Grease a 26 cm (10 inches) round baking pan and line it with the dough. Prick the bottom with a fork. Now make the filling. Clean the artichokes, cut them into thin slices and put them in a pan with a few tablespoons of olive oil and a clove of garlic. 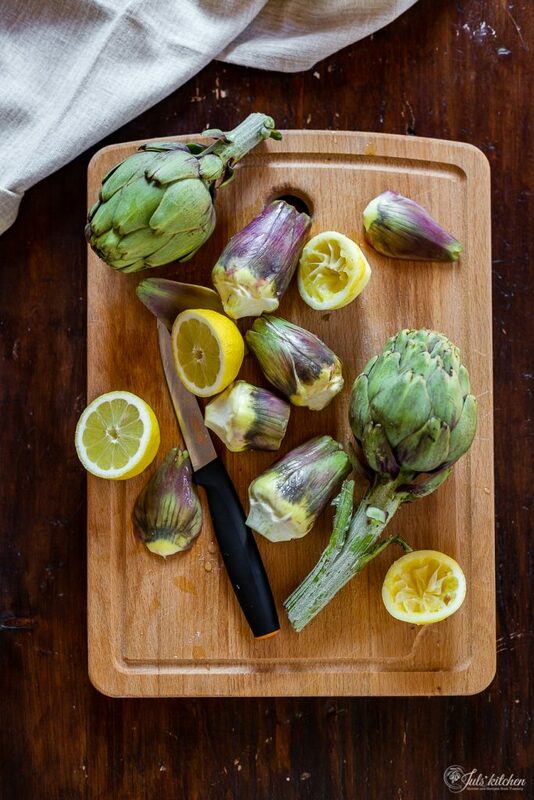 Drizzle the artichokes with the juice of one lemon and cook them on low heat for 10 minutes. Pour in the white wine and reduce, cooking the artichokes for 20 more minutes. Season with salt. 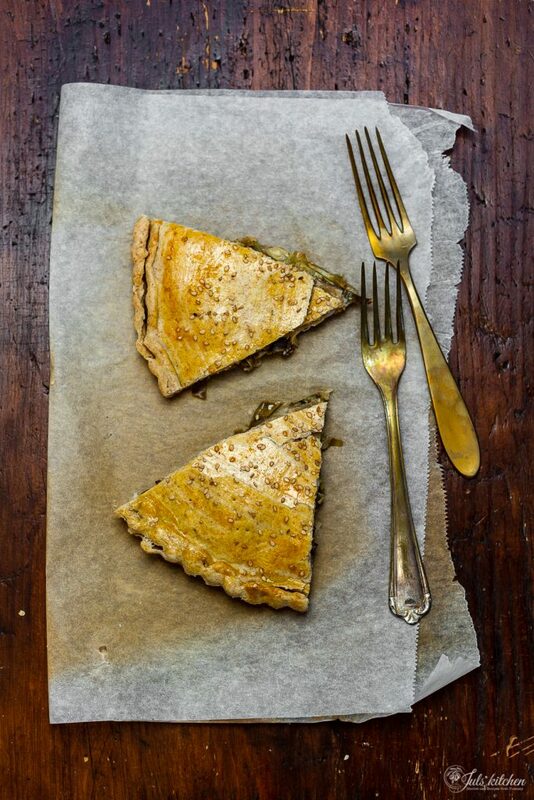 Arrange the slices of pecorino on the bottom of the pie, add the artichokes, then scatter a few pieces of taleggio over the artichokes. Finish with some chopped parsley. Roll out the second piece of dough and gently lay it over the filling. Seal the edges and cut out any scraps of dough. 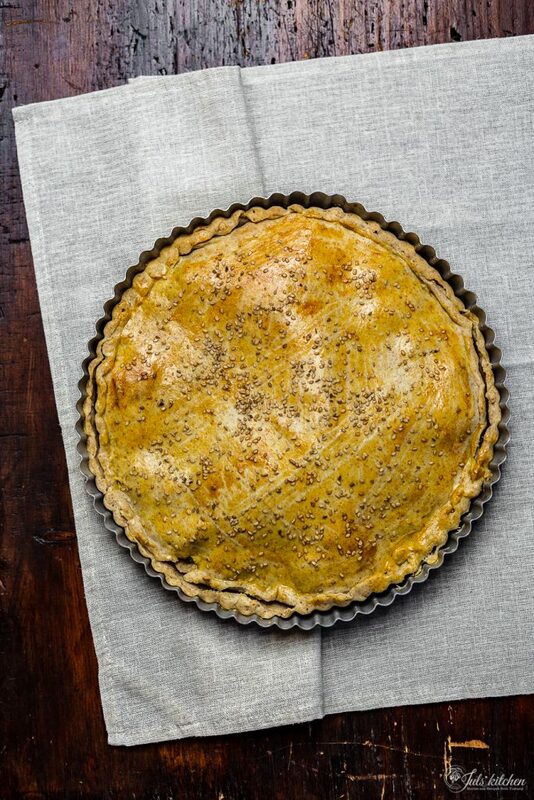 Prick the crust with fork, run with a beaten egg yolk and sprinkle with sesame seeds. Bake the pie for about 30 minutes, until golden. Serve hot or warm. Artichokes are the main characters of many recipes here on the blog, as we love them in Tuscany and we celebrate their season and their spiky goodness. 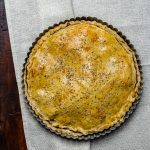 If you are a pie or tart lover, try this lemon scented tart. If you love to use up till the last crumb any piece of stale bread, this focaccia from Salento is for you. Eat them stuffed with rice, in a Spring salad or in a risotto, too. 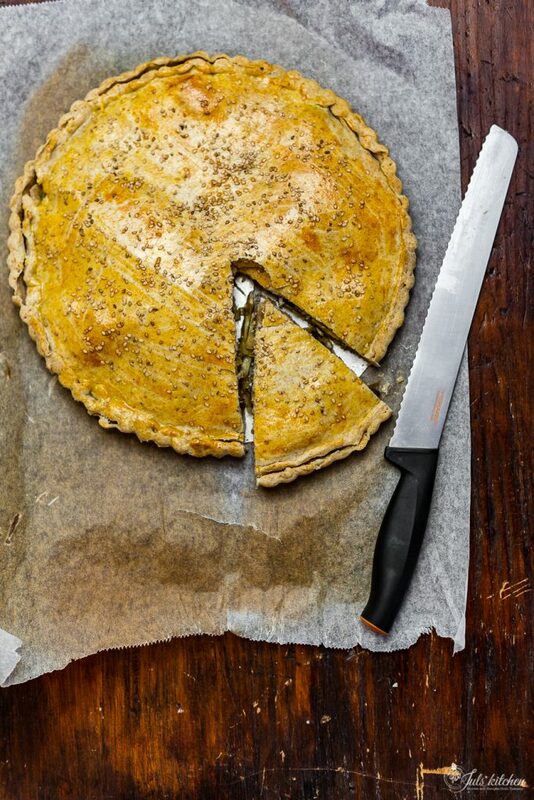 This is the recipe where I learnt to make the dough for the pie: torta con primo sale e zucca. 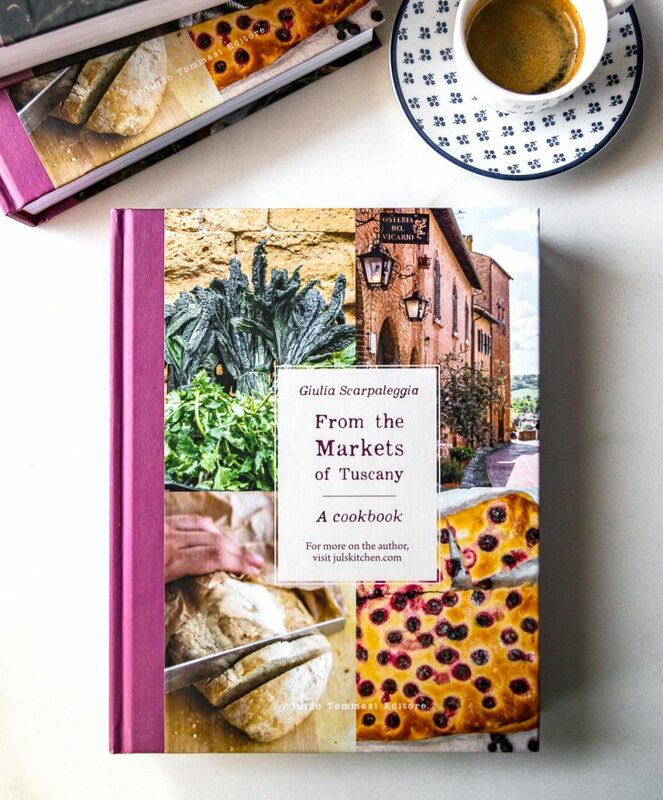 If you can put your hands on good Roman artichokes, try two typical recipes as Eleonora’s carciofi alla romana or Elizabeth’s carciofi alla giudea. The recipe looks delicious!! Now I feel pretty confident that I can cook/bake almost anything but for some reason working with artichokes I’m a complete failure. well, I don’t take failure lightly so I am going to make this terrific looking/sounding recipe. Mille grazie per la ricetta!! We never really get a spring here in NYC/NJ…..it is just chilly, and like you, I change the color of my scarves! I will be trying your torta carciofi soon! You spoke from my heart dear Giulia. This recipe is fabulous and will be on my table soon. Do you know if the alcohol evaporates when the pie is baked? Could the wine be replaced by something else? Made this tonight-all I can say is AMAZING! Grazie! Hello Denise, thank you for letting me know, I as so happy you liked that! I’ve been craving this lately. 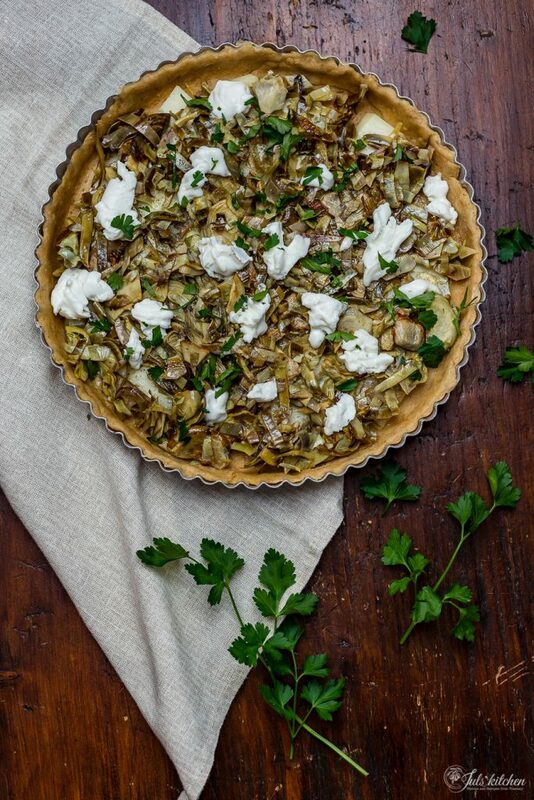 Since it’s not springtime have you made this with frozen or canned artichokes? Not yet, but I’d choose frozen artichokes! Let me know if it works! I used Trader Joes canned artichoke hearts and it was a good substitution. Not as good as the real thing though!! Love artichokes…haven’t mastered using them in the glorious way you do. But I have just grown & picked Jerusalem artichokes in my garden which also have a similiar smoky flavour so I could use them instead. Yummy ! true! they could work as well! previous post: Listen to your butcher. Chickpea crostoni, two ways.